During college, I had a huge desire to learn languages. (I still do.) I also wanted to make a commitment in teaching my children a language young so they might be bi-lingual. After years of school and study, I think I have decided I am going to teach my children German. Here are the ups and downs of this endeavor. 1) I have started learning German myself. I am taking the classes, am immersing myself in child-like songs and am registered for a college level class to learn how to speak, write & interact only in German. I am even trying to work with my husband on this (he just started school himself so it may be more difficult.) But I feel comfortable enough now I could teach my own child right now some information, like “Danke” for thank you and “bitte” for please/you’re welcome. 2) I decided to pick a language that was fun & easy. I agree, German is not for everyone, but you should not pick a language you cannot enjoy yourself. For example, despite the advantages of choosing Korean, I have extreme difficulty speaking any Asian language. This is why I did not choose to learn an Asian language up front. But I will gladly encourage any language knowledge my own child would explore…and maybe I’ll learn “hello” and “goodbye” in any language. 3) I tried teaching my dogs their commands in German. It’s easier than expected because the word “to sit” is setzen and since my dogs know hand and verbal commands (somewhat) I can use the same visual and use a similar word. They get nein now and setzen and kommen (to come.) And dogs are supposedly the same intelligence as a 2year human. Good practice for teaching a new language to a non-speaking mammal. 2) I am just starting this… so if I have children in the next few years, I may know some German, but nothing to communicate fully (well, trying to resolve as I said.) I do know they offer children classes in the area, of which I would greatly appreciate. Again, something to overcome. 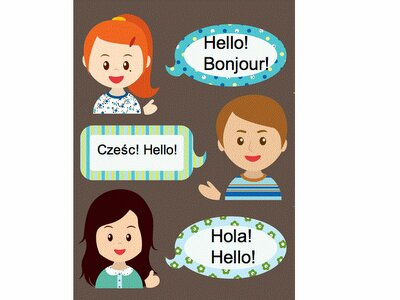 I am curious—how many people out there have thought about teaching their children a second language?? If so, which language? My brother used sign language to communicate, I know of someone else using French… Please post your comments—I am welcome to suggestions and ideas of how to teach a child another language. This entry was posted in Theological ThinkTank and tagged children, language.